Question: As your book is titled "Against all Rules", do you believe in respecting writing rules, in breaking them, or in the middle way? Hi Devika! Thanks for having me on your blog. I’ve visited many times and really liked the ambience. Finally I have a chance to have my say here! Mmm...breaking rules is so much fun, isn’t it? Every child who’s missed on doing homework, knows the sheer – though short-lived – pleasure of thumbing nose at the system. For me, when I’m writing, breaking rules is something like that secret delight. Especially with characters like Tahir and Samara who are determined NOT to break them! In Against All Rules, I had quite a time with them, I can tell you. They are both single-minded, normally so unwavering from their purpose. But passion has a way of forcing you onto paths you wouldn't normally tread. And that was much of the theme of the book. However much they tried to resist it, falling into desire, lust and finally love was something they had to break all their preset rules to do. Speaking about myself – which I'd better tell you I'm not that comfortable with, being somewhat introvert-ish except when I'm having fun, like when I'm deep into writing – I must say, most of my life I have been a dyed-in-the-wool rule follower. I never spoke too loud or drew attention unduly to myself as a child in school. I never came home late as a teen. I've jumped traffic lights occasionally but most of the time I go linearly. Maybe that's why I love writing fiction because you can get characters to go against the tide...hmm, must have a think about that! However, I have gone against the norms on occasion and the most prominent instance was when I took up romance writing. Coming from a traditionalist family, I can tell you, that was one brave thing to do! And I surprised myself because I am the kind who'd compromise rather than create a furore. But for this, I followed my heart even though I was terribly scared of upsetting people I love. When the choice was between writing and quitting, it wasn't an option. Surprisingly, family, after initial upheavals, has been supportive and have come to the point when they don't question my busy time over the keyboard any longer! I guess when passion overtakes, be it in your vocation or in love, the stick-in-the-mud in you doesn’t stand a chance! Samara knows getting attracted to Tahir is like asking for trouble. Not only is he her boss but he’s got divorced recently and has sworn off any commitment. Short term is not on her list but temptation has never been stronger. Tahir doesn’t believe in enforcing a code of conduct he cannot follow. But Samara might just make him make an exception! An affair at the office might seem a solution to his troubles but how can he avoid treading uncharted territory…? 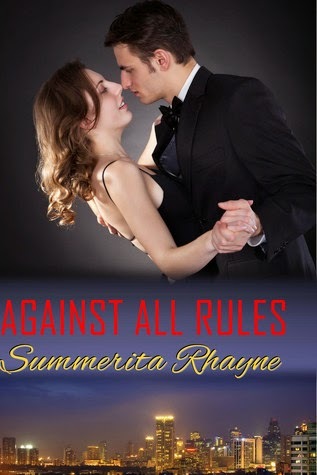 Summerita Rhayne loves to write sensual and emotional romance. There's no knowing when some quirky - or sometimes even not so quirky - happening in daily life might trigger her right brain and then she's off craving a new story. She loves writing characters who learn and grow and find their way out of their troubles and emotional hang-ups. Hot, sensual heroes and sassy but sweet heroines mostly fit the bill in her stories. She also believes that a touch of humor never goes amiss in a book. She divides her time between family, job and writing - and loves winding down with music, movies and the internet! I admire your fortitude and patience in the face of an initially non supportive family. That''s not easy, and I'm glad they are more accepting now. Love your wording. I agree! Thanks for stopping by and commenting. Thanks Flossie. We all have our battles cut out sometimes, don't we? :) However they add to valuable experience and help you to grow better. Do hope you'll check out the book.